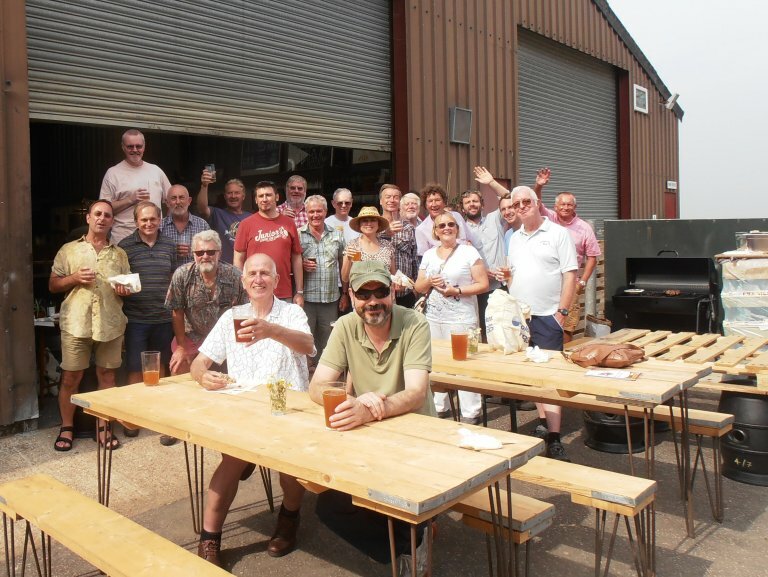 On a hot and sunny August bank holiday Saturday in 2016, 20 members visited Three Legs brewery in Broad Oak. Most had travelled by bus from Hastings but one intrepid individual had shunned public transport and run all the way. “It only took an hour and a half”, he said. That’s one way to work up a thirst but not the one aspired to by the rest of us. The hospitality shown to us by the brewers, Sam and Ben, helped admirably by Nicky, was second to none. They offered tastings of all of their current beers, Pale, Red, English IPA, Dark and Wheat. Additionally a cask of Pale was provided for our sole use. That seemed to go very quickly, helped no doubt by our enthusiastic thirst, the hot day and the excellence of the beer. We then branched out into the various other beers, offered at a very generous discount. They too were of excellent quality. Later in the afternoon we were treated to a barbeque, again very much appreciated by us all. We finally left about 4pm, many weighed down by their purchases of beer to drink at home. Our most grateful thanks to our hosts, Sam, Ben and Nicky for a great visit. They made us all very welcome and gave freely of their time to chat about their brewery and beers. We wish them well in their endeavours and their beers are to be seen frequently in our area, including many festivals. 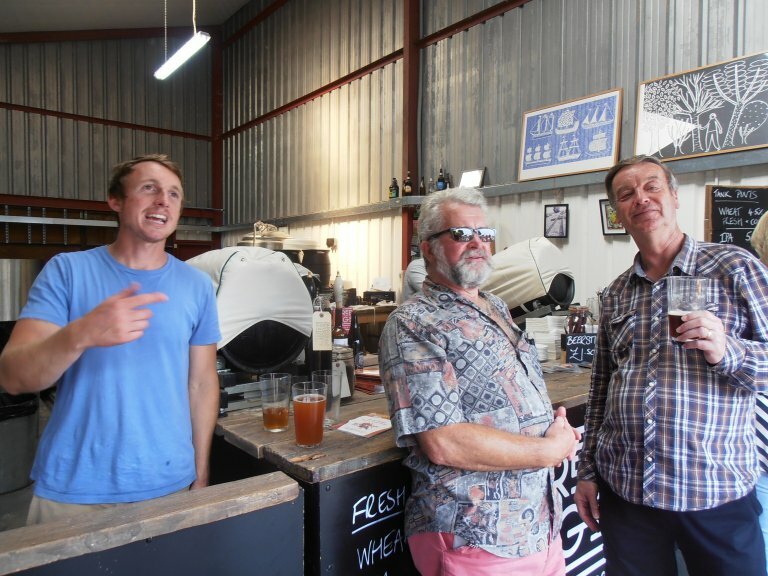 The first photo shows Sam on the left, accompanied by two of our members “supporting” the brewery bar. 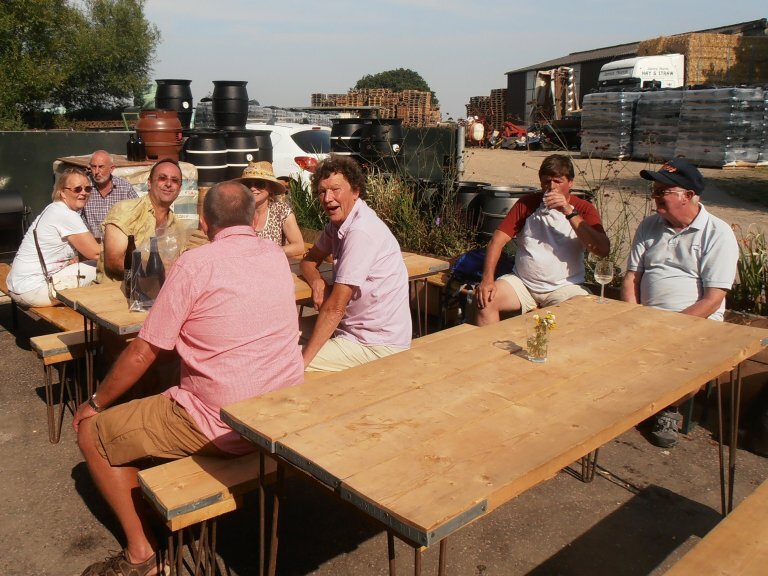 The second is of a few of us enjoying the sun and the third is all of us, with the brewery and bar in the background. Sam and Ben are second and third from the back right.